Authored by: Don Rittner and Ronald A. Bailey, Ph.D. 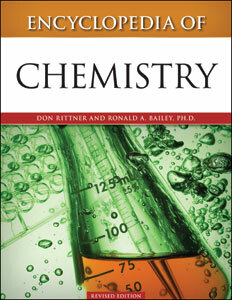 The comprehensive Encyclopedia of Chemistry, Revised Edition is the definitive reference to this vast subject area. Hundreds of chemistry-related entries, thought-provoking essays, leading discoveries, and biographies of notable chemists throughout history provide high school and early college students with the most complete information available. Addressing a subject whose understanding is crucial to all mature science students, Encyclopedia of Chemistry, Revised Edition presents an engaging, informative approach to learning. Additional material directs students to further pursue their studies, including links to informative websites and a bibliography. Students and professionals alike will benefit from the extensive coverage and easy-to-use format of this resource. Don Rittner has been a science writer and author for more than 30 years, writing scientific and magazine articles and books about science for the general public. He is an award-winning professional science writer who is also a teacher and director of an alternative education center that specializes in bringing complex science issues to the general public. Ronald A. Bailey, Ph.D., has been Assistant/Associate Chair in the department of chemistry at Rensselaer Polytechnic Institute since 1991, a year after receiving his Ph.D. from McGill University in Montreal. He has published approximately 50 scientific articles in refereed journals and is the co-author of books on molten salt chemistry, environmental chemistry, and chemistry laboratory techniques.